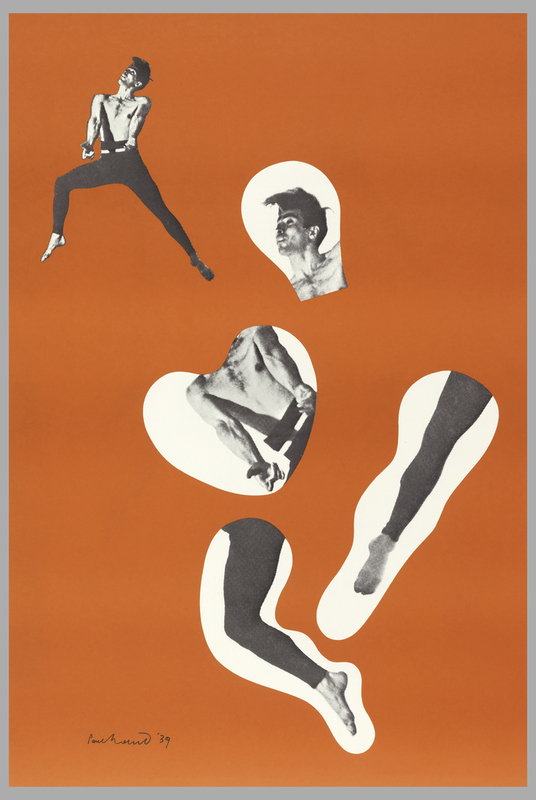 Dancer on Orange Ground is a poster designed by acclaimed graphic designer Paul Rand (American, 1914-1996) in 1939. The poster is taken from the March 1939 cover of Direction magazine, an avant-garde publication that Rand began contributing to that year. Rand is most widely known from his time as the art director of Esquire from 1937-1941 and for his trademark design for IBM in 1956. The Cooper Hewitt has several works Rand designed for IBM, including the company’s letterhead from 1956. From the beginning of his career, Rand was interested in modern painting and took inspiration from the visual languages of Cubism, Constructivism and the Bauhaus teachings. Direction was an arts and culture magazine published from 1937 to 1945 and was idiosyncratic for its modernist synthesis of design and politics. Although the publication had a very limited budget, its editors sought to provide an uninhibited platform for avant-garde creatives to share their ideas. Direction featured diverse contributors ranging from Le Corbusier and Jean Cocteau to exiled German writers, exploring the visual culture of modernism in conjunction with political commentary. It was through his covers for Direction that Rand was able to develop and solidify his modernist graphic aesthetic. Dancer on an Orange Ground is archetypal of Rand’s covers, combining the image of a dancer in motion with a tangerine orange background. Rand has placed the complete image of the male figure in the top left corner of the poster whilst juxtaposing it with fragments of the same image scattered towards the bottom right corner. While the intact male dancer sits directly on top of the orange background, Rand places the partitioned images on top of amorphous white forms. By separating these formerly intact images, Rand removes their recognizable functions, transforming them into abstract imagery. The combination of a boldly colored, flat background and a diagonal composition with surprising juxtapositions in scale, evokes the aesthetic of the Constructivists. The aggregation of visual inspirations in Rand’s covers is indicative of the wide array of content in the magazine, exemplifying Rand’s aspiration to integrate the modernist aesthetic with mass appeal. As Rand wrote in his first book Thoughts on Design, “Even if it is true that the average man seems most comfortable with the commonplace and the familiar, it is equally true that catering to bad taste, which we so readily attribute to the average reader, merely perpetuates that mediocrity and denies the reader one of the most easily accessible means for aesthetic development and eventual enjoyment.” Rand’s covers for Direction reveal a delicate balance between aesthetics and communication and helped to establish Rand as a pioneer of American graphic design. This post was written by Lily Gildor, a candidate in the MA History of Design and Curatorial Studies program offered at Parsons The New School of Design jointly with Cooper Hewitt, Smithsonian Design Museum. She is a Master’s fellow in the Drawings, Prints and Graphic Design department. Margaret Barlow, “Paul Rand,” Grove Art Online, accessed October 13, 2016, http://www.oxfordartonline.com/subscriber/article/grove/art/T070729. Michael Rozendal, “An Engaged Mass Audience? The Provocations of a Popular Front Slick, Direction (1937–1945),” The Journal of Modern Periodical Studies 3, no. 2 (2012): 202, accessed October 13, 2016, http://www.jstor.org/stable/10.5325/jmodeperistud.3.2.0198. Steven Heller, Georgette Ballance, and Nathan Garland, Paul Rand, a Designer’s Words (New York, 1998), 7.